Advancement reviews are some of the most important reviews that we give judges, and they often serve as an introduction to the peer review process itself. They not only remind judges of what happened during the interview and exam portion of the advancement process but also provide tools for success at their new level. With a failed advancement review, these benefits are even more crucial. The judge needs more than a handful of study tips. The failed advancement review can connect the judge to a supportive community with regional resources that clarify a path toward future advancement. This section covers information about the exam. This feedback can be anything from big picture ideas (e.g. ‘please read through MTR section 2 focusing on 2.3 Pregame Procedures) to very specific things (e.g. ‘modifications to Power and Toughness apply in layer 7c’). This section covers what was discussed during the interview. I like to use as many actual quotations from the interview as possible so that when the candidate reads their review, they can see what they actually said along with my responses. This section can also serve as a great point of reflection for the candidate when re-reading the review. This section compiles information that will be helpful to the candidate as they become members of the judge community. Links to community Facebook pages, helpful resources, official sources, best practices, and personal advice are great. And because this section is tailored to a judge level rather than a particular judge, it can be updated as needed and reused in other advancement reviews. These three key advancement review components don’t line up with the standard review format. As Riki and others have written, those three required blocks (Strengths, Areas for Improvement, and Comments) aren’t necessarily ideal. But you’re not locked into a single way of using them. You can use the review form in the way that you believe your information will be best interpreted. In the sample advancement review below, I’ll demonstrate how I fit the three key components of an advancement review into the three box format. This section will cover the information we discussed during the exam debrief. A permanent is flagged if the effect creates a continuous effect (affects the layers) while a permanent is clouded if the effect changes the rules of the game (doesn’t affect the layers). An example of this is “Creatures you control get +3/+0 until end of turn” vs. “Creatures you control can’t be blocked this turn”. The first effect flags, meaning only creatures on the battlefield at the time of resolution get that effect; whereas the second effect clouds, meaning a creature entering the battlefield after resolution would still get the effect. This section will cover the information we discussed during the Interview. This is 100% along the lines that I expect to see from L1 candidates. The program wants to know that Local Judges (L1s) will be knowledgeable of the rules and tournament procedures. You should also think about your role as an ambassador for Magic and the judge program. For many players, you will be their first interaction with Organized Magic Play. This section will include my final comments and some useful resources. Please visit judge.wizards.com often to write reviews and create practice tests for yourself. It’s the hub for all things related to testing and reviews! Please create your profile at apps.magicjudges.org as soon as possible! It’s the hub for all things related to event and tournament operations. On this site you will find our judge forums, where you can ask questions of the wider judge community and access event solicitations! Visit these Facebook pages, Michigan Magic Judges and Great Lakes Magic Judges, for central communication with your local community of judges. At this point you should already be added to these groups so please feel free to post and message people as you need things! Slack, a large chatroom, is the prefered method of communication for the Great Lakes region. You can find the group here, and I will reach out in a separate email to add you as a user. The judge program has broken up the world into regions. The Great Lakes (Michigan, Indiana, Ohio, and Kentucky) is your region and your Regional Coordinator is L3 Jarrod Williams. Jarrod is open to any questions, comments, or concerns you may have, and I recommend reaching out to him on Slack. The Great Lakes region uses a system of Area Captain to assist the Regional Coordinator with day to day operations. Your Area Captain is Meg Baum, and she is here to help you with any immediate concerns or situations that arise! Use yawgatog.com often! It’s a great resource that hyperlinks the Comprehensive Rules. Consider using magiccards.info for looking up cards. I use this tool when creating scenarios for teaching or looking up cards using meta data. 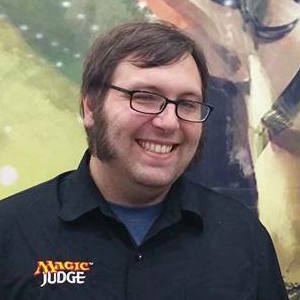 At blogs.magicjudges.org/rules, you will find the Comprehensive Rules, Annotated Magic Tournament Rules, Annotated Infraction Procedure Guide, Judging at Regular REL, and much much more! It’s the hub for all rules documents! There are many ways to level up your advancement reviews. As you try new approaches to the advancement review, I encourage you to share that knowledge amongst your mentors and peers. The strategies I’ve outlined here are designed to incorporate as much useful information as possible into the review as a way of connecting judges with their communities and providing them with tools for success. What has been most beneficial in an advancement review you’ve received? What tips and tricks would you recommend to advancement review writers? Share your thoughts in the comments below or email me.